"Miracle Skin Transformer SPF 20- An antioxidant-rich tinted skin enhancer that leaves your skin airbrushed, hydrated and protected in one easy step. Who knew that one product could transform skin instantly? Miracle Skin Transformer SPF20’s first-ever naturally derived silicone formulation is designed to improve skin texture, minimize fine lines and pores and reduce pigmentation spots over time. MST treat and conceal- Erase imperfections with pigment rich coverage. Miracle Skin Transformer Treat & Conceal illuminates and visibly reduces imperfections. Blends seamlessly, immediately improving the complexion for flawless, fresher looking skin. Miracle Skin Transformer Body SPF 20- is a high performance tinted treatment body enhancer with a naturally derived silicone base plus antioxidants and natural actives that zeros in on your body’s skincare concerns to give skin a total transformation. Transform the appearance of arms, legs and décolleté – you’ll see a difference instantly: Skin looks smoother, firmer, and totally flawless." These products do what they promise to do! I used the MST treat and conceal under my eyes and the MST SPF 20 all over my face. I didn't need to use my photo finish because this product does the same thing, smoothes out your skin and makes you look perfect! My skin looked flawless when I wore them and my husband kept telling me I look like a doll. (Well you don't see too many dolls with uneven skin, so I think that's what he meant.) My skin tone looks even, and in photos, it's down right amazing. I'd even explain it as porcelain esk. Yeah, that great! The MST body was also a pleasant surprise. I used it on my arms and the tinted lotion smoothed away any imperfections and made them look perfect and the glow picked up the right amount of light in photos. I can't wait to use this product on my legs on NYE. You need no hosiery because the MST body makes the skin tone even and smooth. Now for the really exciting part. One lucky winner will win all 3 MST products I tried! To enter to win (Miracle Skin Transformer SPF 20, MST treat and conceal, and Miracle Skin Transformer Body SPF 20) worth $118, leave me a comment in the comments section below telling me which Miracle Skin Transformer product you’d most like to try. Visit miracleskintransformer.com to see all the fabulous products they have. Make sure you leave me your email below too! I must receive all entries by 1-11-12 and the odds of winning are determined by the number of entries received. No purchase necessary to enter. Winner will be announce 1-12-12 at 7:00 am. 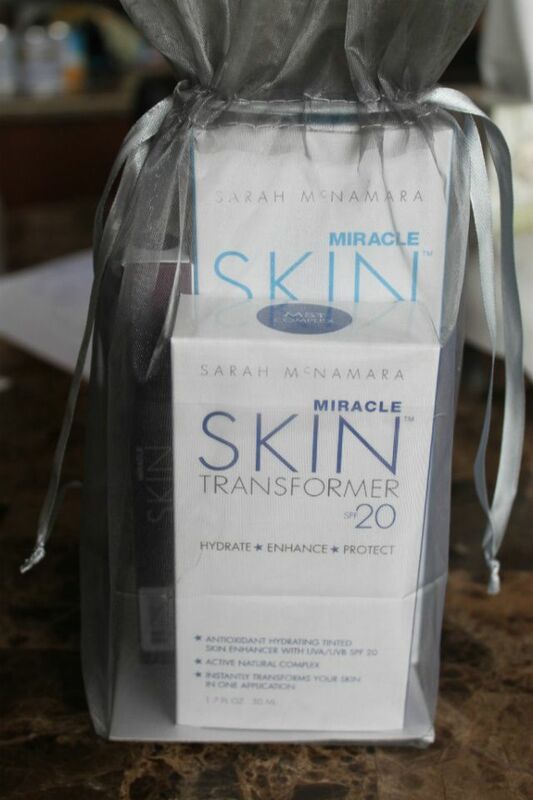 I'd love to win the Miracle Skin Transformer (SPF 20). I've also followed Sarah McNamara on Facebook and Twitter. 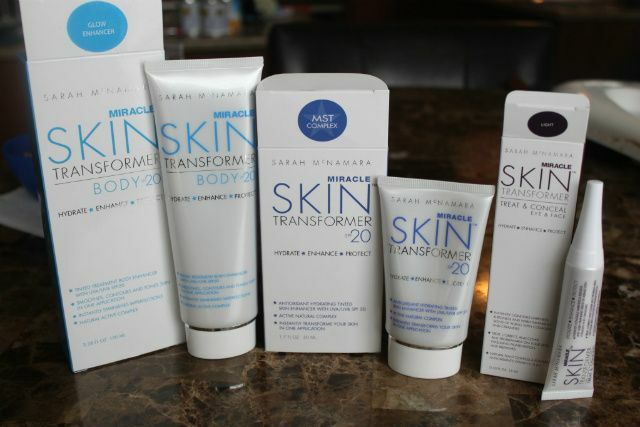 I tweeted @MiracleSkin and @sadbblog are giving away Miracle Skin Transformer products! I liked on FB and left comment. name CynthiaJoyKnisley. Following on twitter and tweeted your message, name Cynderma@aol.com Don't have a tumbler account and don't know how to do it. I have never tried any of it so would love to try all products!! I'd like to try the Miracle Skin Transformer SPF 20. Thanks for the giveaway! I "Like" Sarah McNamara Beauty on Facebook. I follow Sarah McNamara Beauty Miracle Skin Transformer on Twitter @mom22girlz. Sounds cool! I'd like the Miracle Skin Transformer SPF20. I've heard amazing things about MST treat and conceal, so I'd like to try that first! I like Sarah McNamara Beauty on Facebook (Melissa D*****). I follow Sarah McNamara Beauty on Twitter (@glossome). I would most like to try Miracle Skin Transformer SPF 20. I liked SM on FB and I now follow Stilettos and Diaper Bags by email. I Liked MST on FB. This stuff is the best! I follow Sarah McNamara Beauty on Tumblr. I also liked on FB and am following on tumblr. Awesome giveaway! I would love to try the Miracle Skin Transformer SPF 20. I liked Sarah McNamara Beauty on fb! I follow Stilettos and Diaper Bags by email! i want to try this so bad! heard so much good stuff about the product would llllove to win! i like sarah mcnamara on fb, i get stilettos and diapers email. I'm getting close to (gulp) 50 and I'm having a hard time looking in the mirror anymore. I'd love to try the concealer to see if it would hide, or at least, help hide my very dark undereye circles. Miracle Skin Transformer SPF 20! I'd like to try all of them, but specially the Miracle Skin Transformer Treat & Conceal. I Like Sarah McNamara Beauty page on Facebook. I Follow Sarah McNamara Beauty Miracle Skin Transformer on Twitter. I love, love, love MST!!! I've used the MST SPF 20 since Sept. and treat & conceal for about 2 weeks. Without a doubt the treat & conceal is the best I've ever used. I can't recommend both products enough. I'd like to win any of Sarah's products, but if I have to pick one to try I suppose that it would have to be the MST Body, since I've haven't used it yet. I liked MST on Facebook several months ago after seeing Dr. Oz recommend the product. I added MST to my Twitter friends a couple of months ago when I finally got around to joining it. I just tweeted the required message. Thanks so much for the chance to win some of Sarah's super products! I just liked Sarah McNamara Beauty on Facebook. Would love to try this out. HEY! I would love to win this incredible Miracle Skin package! I would love to try the Miracle Skin Transformer SPF20 Light because it's an all in one & you can wear it alone like a foundation! I would love to try Miracle Skin Care products. I would love to try the MST treat and conceal, sounds like it would be perfect for me. The product I would LOVE to try from Miracle skin is "Miracle Skin Transformer Body SPF20"
I followed you on twitter and i followed Miracle skin also under "ramaal83"
I followed you on Facebook "roro hamwi "
I am very interested in trying MST Treat and Conceal. I'll bet it could help with those dark circles and blemishes! Already am a fan of MST tinted moisturizer. Following Sarah McNamara on fb. nlc4591@yahoo.com, pls!! I need the Miracle Skin Transformer Body, for summer events like weddings! I have very uneven skin tone, dark circles, and acne marks. I've heard about these products from my sister who recommended them. Hopefully they'll be something that will help my skin. I've never won anything! I would really like to try Miracle Skin Transformer SPF 20, for its lighter coverage. ok..Ran across this and it is too cool!!! Tweeted about this awesome give-away!! I really want to try the Miracle Skin Transformer Treat and Conceal! Thanks for the giveaway! I "like" Sarah McNamara Beauty on FB! Ohhh treat and conceal sounds like what I need!!!! Hi. I have just tried a sample of both the concealer and the skin transformer spf20 and I have to say I have fallen in love. Can't wait to go out and buy them both. Now that you are showing this Body transformer I HAVE to try it, I am sure it is just as amazing. Good Luck to me!!! I would like to try the Skin Transformer SPF20. Fast approaching 50, I would love to discover a way to grow older gracefully. I've always been curious about MST products for sometime now, I receive MST mailers occassional but was a little hesitant to follow thru...and having the opportunity to sample Sarah McNamara's product line would wonderful! I follow Sarah on Facebook, I would love to try the Treat & Conceal the most of course I would love to try all three products but following instructions only naming one. Everybody good luck! Pick me! And follow my blog at www.incineratingdiamonds.com. I don't do contests, but I'll share all of my inspiring moments throughout the year! Also, I did the following and I followed you via blogger! I would love to try the Miracle Skin Transformer SPF 20 in medium!